"Steps to successful Cloud Sandbox deployment:"
Cloud sandboxing is the key to the successful modeling of production-like environments and consolidating Lab-as-a-Service (LaaS) test clouds. A modern LaaS cloud sandboxing platform provides the foundation for infrastructure-aware test and continuous integration (CI) automation. 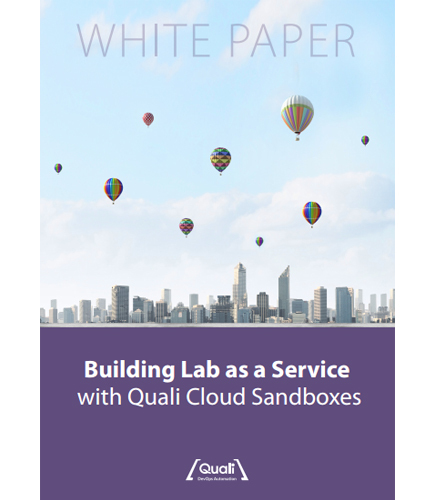 This whitepaper on “Building Lab as a Service with Quali Cloud Sandboxes,” provides insights for organizations that are seeking to merge multiple labs into centralized, shared data centers that can be used by many remote user groups. Cloud Sandboxing for Financial Services will ensure that your applications run smoothly on your large and complex infrastructure. Financial Services applications are becoming more complex and sophisticated – embracing newer technologies while at the same time having to support core services that are based on legacy and on-premises specialized systems. This whitepaper discusses these challenges faced by Financial Organizations, and introduces the concept of Cloud Sandboxing as an enabler for DevOps processes. How can sandboxes help you achieve faster application delivery? How do ­financial services organizations move to DevOps and deliver secure high quality applications at scale? How sandboxing provides the basis for good early application compliance security testing?